Former Boston Bruins first-round pick lives in Falmouth, is now playing in Portland. FALMOUTH — The phone call came a few days after Christmas, just as Ellie Toivonen was buckling 2-year-old Luca and 5-year-old Jack into their car seats in anticipation of a family sleigh ride in New Hampshire. Her husband answered, nodded, and thanked the caller, then notified his wife that he wouldn’t be able to join them. Within a few hours, Hannu Toivonen was suited up in his hockey equipment and serving as a back-up goaltender at Cross Insurance Arena for the ECHL Maine Mariners. This winter has been far from normal for the Toivonens, who have dwelled at 18 different addresses in four countries since getting married a decade ago. 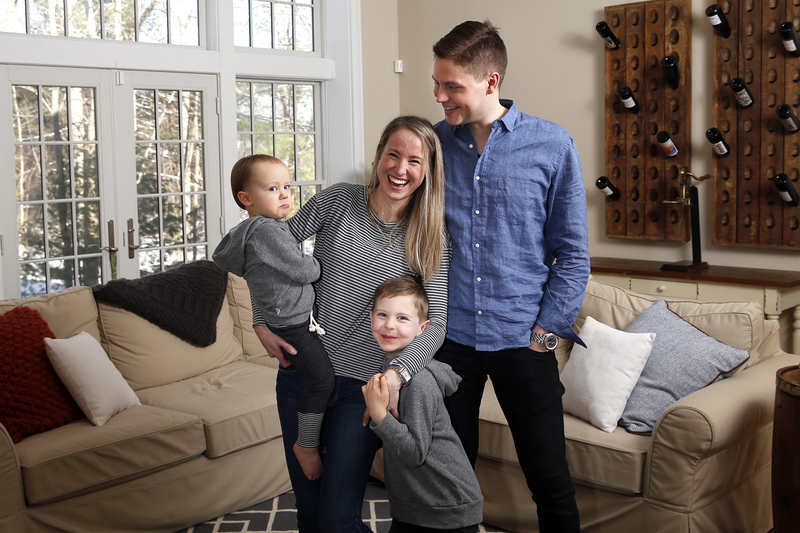 The crazy thing about this winter is that Hannu, who played in the National Hockey League for the Boston Bruins and St. Louis Blues, gets to live in the Falmouth home that he and Ellie purchased five years ago to accommodate their growing family. The Bruins drafted Toivonen in the first round in 2002 and a year later sent him to their American Hockey League affiliate in Providence for two seasons. He faced the Portland Pirates multiple times — mostly recently in 2005 — inside what was then known as the Cumberland County Civic Center. As a Bruins affiliate, Providence drew big crowds throughout New England. The team was stocked with veterans both years. Toivonen wound up playing 38 games over two seasons with Boston, compiling a 12-14-5 record with a 3.33 goals-against average from 2005-07. That’s where he met a Regis College student named Ellie Scribner at a mutual friend’s birthday party. She grew up in Bridgton and had played soccer and lacrosse and run track at Gould Academy in Bethel. The Bruins traded Toivonen to St. Louis and he played 23 more NHL games in the 2007-08 season, then bounced around the AHL, Sweden, Finland, the ECHL and last fall found work in southern Austria, where Jack enrolled in a kindergarten class in German, his third language. Along the way, Hannu and Ellie got married, bought a home in Scarborough and welcomed two boys. Their only season apart came in 2013-14, after Jack was born, when his father shuttled between Toledo and Milwaukee with a stop in Des Moines. When news broke of minor-league hockey returning to Portland, they considered the possibility of Hannu playing for the expansion ECHL team. Over the summer, Hannu contacted Mariners coach Riley Armstrong to express his interest and availability, but Armstrong knew Maine’s NHL affiliation with the New York Rangers likely would result in goalie prospects sent to Portland. Sure enough, Brandon Halverson and Chris Nell came north to join Connor LaCouvee, already under contract to the Mariners. In the fall, Toivonen found work in the Czech Republic and then Finland but decided to return to Maine for Christmas. 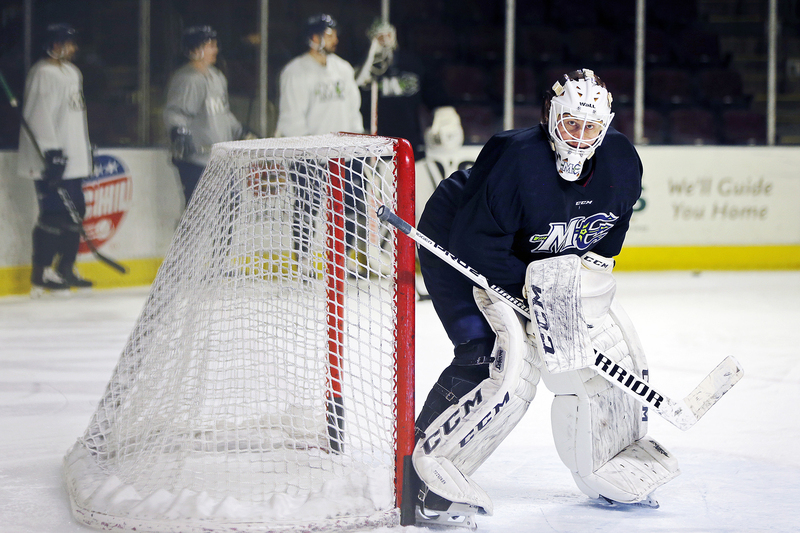 Armstrong called him after two of the Mariners’ goalies were sent to other teams. 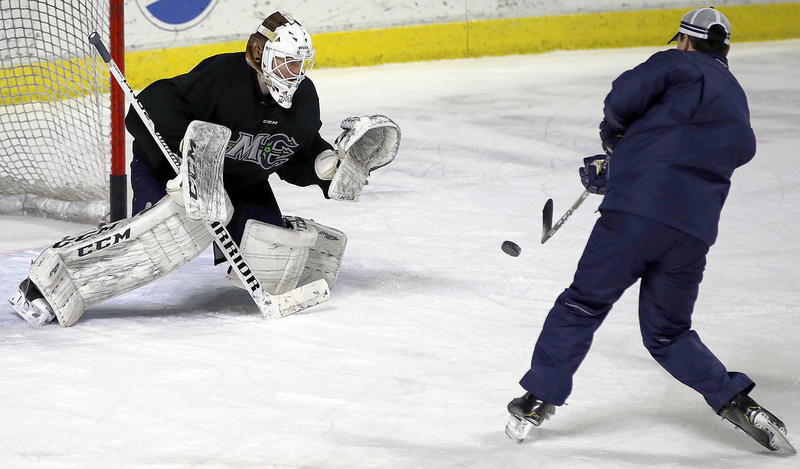 The following night in Worcester, Toivonen stopped 41 of 42 shots as the Mariners beat the Railers 3-1. He played four more games in Newfoundland and Ontario, with Maine winning one and losing three, but has yet to see action in Portland. There are now younger goalies on the roster who need playing time. “The tricky part with Hannu in this situation,” Armstrong said, “is that I feel he’s past his developing stage. One thing Toivonen is doing is setting an example for his younger teammates, letting them know how a professional hockey player goes about his business, how to take care of your body if you want a long career, how to handle your free time. Should Toivonen, who now is on injured reserve, want to continue working in hockey as a coach, Armstrong said this season could be a good stepping stone. Toivonen agrees, but isn’t yet ready to hang up his pads. Veterans helped him when he was young, and he feels a debt both toward them and to the sport of hockey. Back home in Falmouth, Jack is downstairs hitting golf balls into a net and providing running commentary. He has joined the Casco Bay Hockey Association and can walk to the nearby Family Ice rink. Luca races around the living room and beneath the dining room table, a toy car in each hand and the Lightning McQueen catchphrase “Ka-chow!” spewing from his lips. 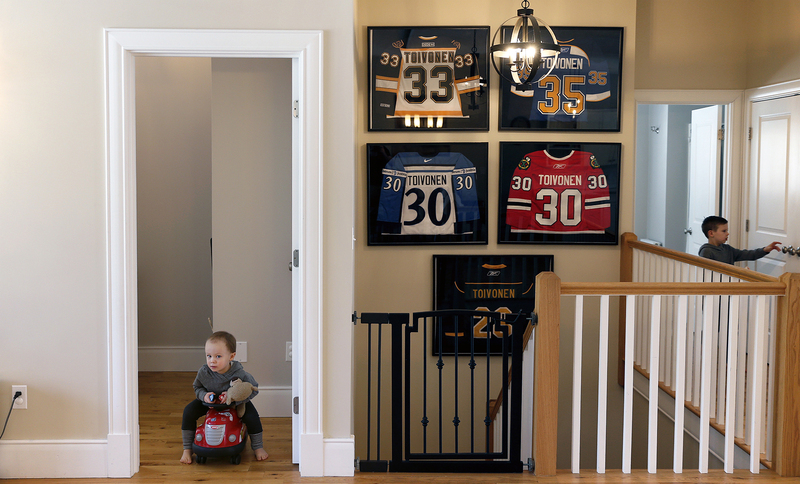 On the side of the refrigerator, beneath the preschool artwork of Jack Toivonen and Halloween photos of him and his younger brother Luca, hangs a Mariners hockey schedule. Halloween, not widely celebrated in Europe, was a first for the boys, who dressed up as plump jack-o’-lanterns. “They give us candy, voluntarily?” said Hannu, mimicking his son’s amazement. The Toivonens smiled at their good fortune. After all those years on the road, all those exhilarating but exhausting adventures abroad, they finally get to spend a hockey season at home. It’s a sweet life, all right.